Billboard highlights lack of legal protection for America’s national mammal. Beginning this week, travelers driving west on I-90/94 near Billings, Montana, will encounter a billboard to “Protect Our National Mammal” promoted by the wild buffalo advocacy group Buffalo Field Campaign. The West Yellowstone-based nonprofit hopes the billboard reaches the millions of people traveling through Montana to Yellowstone National Park. According to Mike Mease, co-founder of Buffalo Field Campaign, the billboard shines a light on the lack of legal protection for America’s national mammal. The North American bison, also commonly called buffalo, became the national mammal of the United States following the signing of the National Bison Legacy Act by President Barack Obama on May 9, 2016. The billboard directs passersby to visit www.HelpWildBison.com. At the web site, the group asks people to contact Montana’s Governor Steve Bullock to make more room for the wild species to roam in Montana, and to push U.S. Congress to enact legal protections for America’s national mammal. 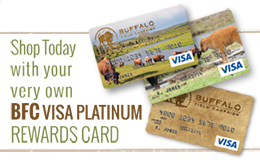 For more information, visit www.HelpWildBison.com.